Among the keepers on my bookshelves is a tattered paperback copy of Lord Wraybourne’s Betrothed. I bought it in 1990 because I had already read a hardcover library copy and knew that it was a book I would reread. I was right. I have been rereading it for almost thirty years. I didn’t know when I first read the novel that it was Jo Beverley’s debut. I only knew that I loved the characters who were so fully creatures of their historical moment and that I wanted more from this gifted writer. That paperback is twenty-seven years old now, and my Jo Beverley shelf is filled with her traditional Regencies, Georgian and Regency historicals, Medievals, and a few fantasy novellas. I cherish them all, but, of course, I have my favorites. Emily and the Dark Angel is my favorite Beverley traditional Regency—or classic Regency, to use the term Jo preferred. Her choice is more accurate since her books were never exactly traditional. 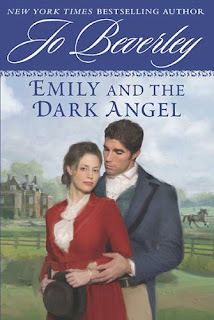 I can’t count the number of times I have read Emily and the Dark Angel nor the number of times I have read a reader’s comment avowing love for the book and known I had found a friend. Certainly there are many romance novels that feature a high-achieving spinster and a rake, but none so lively, so engaging, so delightful as the story of Emily Grantwich and Piers Verderan. And I always feel a bit smug when I come across references to Melton Mowbray in books, confident that I learned all I need to know about Regency England’s hunting mecca from Jo Beverley in Emily and the Dark Angel. Readers entered Jo Beverley’s Rogues World for the first time with the publication of An Arranged Marriage in 1990, although the author had been writing about her company of Rogues for more than a dozen years by then. The Rogues are a group who band together as schoolboys at Harrow under the leadership of Nicholas Delaney. Their friendship endures through the years, and as An Arranged Marriage opens in 1814, Nicholas calls upon some of them for help. In later books, Nicholas is often the one his brother Rogues turn to for help. One of the things I have always liked best about this series is that as the Rogues marry, their wives become part of the company. The series includes books for nine of the Rogues: An Arranged Marriage, the Honorable Nicholas Delaney, 1991; An Unwilling Bride, Lucien de Vaux, Marquess of Arden and heir to the Duke of Belcraven, 1992; Christmas Angel, Leander Knollis, Earl of Charrington, 1992; Forbidden, Francis Haile, Lord Middlethorpe, 1994; Dangerous Joy, Miles Cavanagh an Irishman and heir to the Earl of Kilgoran, 1995; The Dragon's Bride, Con Somerford, Viscount Amleigh, 2001; Skylark, Sir Stephen Ball, lawyer and a reforming Member of Parliament, 2004; Rogue's Return, Simon St. Bride, the Rogue who has been in Canada for the War of 1812 and its aftermath, 2006; To Rescue A Rogue, Lord Darius Debenham, younger son of the Duke of Yeovil, 2006. The story of a tenth Rogue (Major Hal Beaumont) is woven through the other books, and two of the Rogues were killed in battle and are only mentioned in the series. The remaining eight books feature various relatives, friends, and connections of the Rogues. are comfort reads for me; I turn to them when I need to escape my world or when another romance novel disappoints me. As a reader, I embrace them wholeheartedly; as a writer and reviewer, I am particularly impressed with the heroes. 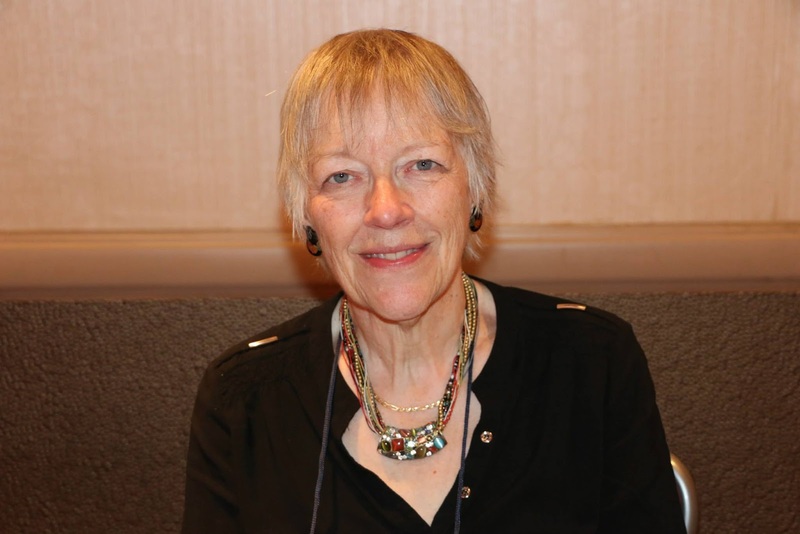 Jo Beverley created some of the most memorable heroes in romance fiction in her original Rogues, and she did so by taking considerable risks. Nicholas Delaney, perhaps her most charismatic hero, chooses love of country over love of spouse. He is unfaithful to his wife after they fall in love because his affair with a despicable female villain is part of a government plot to trap a dangerous spy. The Marquess of Arden strikes his wife in anger. Lord Middlethorpe is a virgin who is seduced by a more sexually experienced heroine, Hal Beaumont lost an arm in war, and Lord Darius Debenham is an opium addict. None of these men fits the common view of romance heroes, and yet I accept them as just that and keep falling in love with them again and again. The reader is prepared for his physical and mental prowess, for his near omniscience, for his brilliance in execution of his plans, for all the qualities that have made him such a large presence in the first four books of the series. But in his own book, Beverley moves beyond the larger-than-life Eminence Noir to reveal the essential loneliness and sorrow that make up the character of this man whose life has been shadowed since early childhood by the heinous action of his mother and who, at the age of 19, inherited his title with all its responsibilities, the well-being of his younger half-siblings paramount among them. Early in Devilish, Bryght thinks of Rothgar as “fascinating and admirable, but at times . . . scarcely human.” What Beverley does in this fifth book is render Rothgar human, to show his fears and frustrations, to reveal a man vulnerable to love. The result is an even more complex character. 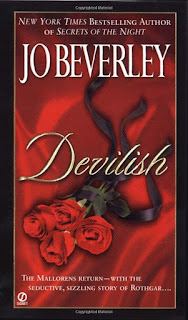 Devilish remains one of Beverley’s most popular books and Rothgar, her most famous hero. I still think it is too bad no one has ever brought Rothgar to the screen, large or small. and 2013, Beverley set another eight books in the Malloren world. 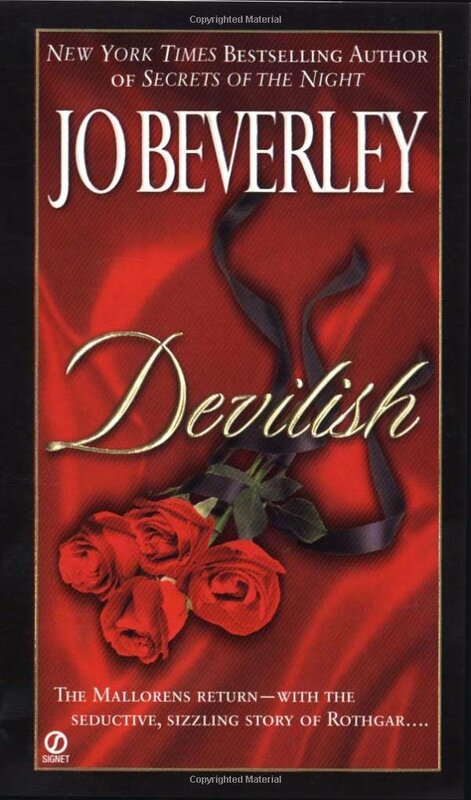 A lesser author might have found it difficult to maintain the standards set by Devilish, but some of Beverley’s finest work can be found in the books that followed. Winter Fire (2003) is my favorite. I reread it every December for the joy of experiencing Christmas at Rothgar Abbey with all the English traditions plus an Italian touch with the presepe (creche) belonging to the heroine Genova Smith. A Most Unsuitable Man, which is a true sequel to Winter Fire, is also excellent. (The hero, Octavius Fitzroger, is a descendant of Imogen of Carrisford and FitzRoger of Cleeve, the protagonists of Beverley’s Medieval, Dark Champion, 1993.) I also love A Lady’s Secret (2008). How can you not love a book that opens with a cursing nun and ends with a father-daughter reunion? I call this one Jo’s secret-baby book. In addition to Dark Champion, Beverley wrote three other medieval romances: Lord of My Heart (1992), The Shattered Rose (1996), and Lord of Midnight (1998). I’m not a big fan of this sub-genre, and I read very selectively in it. It is a measure of my respect for Jo Beverley that I have read all four of these books as well as her three novellas set in the Medieval Period. Both Lord of My Heart and Dark Champion were Rita finalists, but my favorite in this group is the novella “The Wise Virgin” from the anthology The Brides of Christmas (1999). It has feuding families, mistaken identity, a Golden Lion of a hero, and an ending that resonates with Christmas meaning. With Merely a Marriage, her posthumously published novel, Jo Beverley ended her career in her Rogues World where she began it. I delayed reading my ARC of the book because I was sad that it was her last book. I waited for Rothgar (eight years, I think) and joined the Dare’s Alive bandwagon. Every time the subject of unwritten stories romance readers long to see written arose, I shared my hopes for the story of Kevin Renfrew, the Daffodil Dandy, one of my favorite Beverley creations. Before the word “autobuy” was in my vocabulary, Jo Beverley was all I needed to see on a book cover to buy the book. 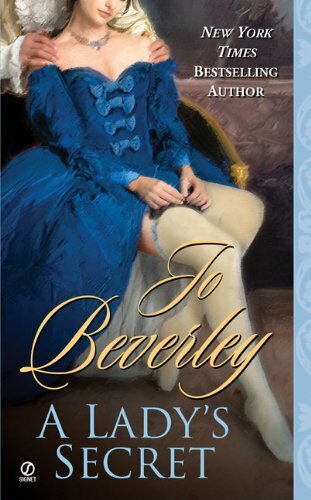 Jo Beverley and her books are woven through my history as a reader of romance fiction. I am having a difficult time imagining a year with no new book to add to my Jo Bev collection. But I am grateful that I can reread the forty-one novels and more than a dozen works of short fiction she left us. I will remember Jo Beverley for more than her books. Although I never met her, I had contact with her in various ways online. She was always gracious and generous. 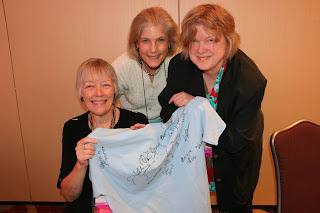 Several years ago, I was part of the Romance Vagabonds blog. Jo had agreed to be an author guest on our site. Several months after we had scheduled her visit she emailed me saying that she would be traveling on the scheduled day but she would find a way to read and respond to the comments. How she did it, I’ll never know, but she did. The Vagabonds were elated as were the fans whose questions she answered. A classy lady who respected her readers—that’s also the Jo Beverley I will remember. Yes, Virginia, love exists and men and women can have healthy lives together. You only need to look around you to see the evidence. Romance novels carry the flame of this essential truth. They make up a rich and deep world of voices, a world of choices, with a story for almost everyone. And that's why romance is the most popular form of fiction today. For twenty-eight years, Jo Beverley gave us stories in her inimitable voice, stories like those she described. She helped to make romance “the most popular form of fiction.” If you have never read a Jo Beverley book, what riches await you. If you have, isn’t it time to reread one and remember Jo Beverley? I was lucky enough, after so many years of admiring her writing, to meet Jo Beverley at the 2007 RWA conference in Dallas. I told her I'd been a fan for years and that I'd admired some set-down she'd delivered online. She laughed and made a self-deprecating remark. I wish I'd written it down. I'm sure it was witty. But I'm content with the memory of her in the peak of health, and laughing. RIP JoBev. You made an impact on this little Alabama girl's life, and I've got the published novels to prove it. You are missed. What I loved most about Jo Beverley's writing was how easy it was to slip into the worlds she created. Medieval, Georgian or Regency - you were guaranteed families, comrades, friends loyal and true to one another; all at the core of who they were and at the base of what their worlds were all about. The characters in her books were multidimensional both as heroes, heroines and villains. She wrote both the alpha and beta hero with such finesse. Intricate. Intriguing. Page turners all. And her villains. Ah, written as such ruthless, depraved characters from all walks of life. Jo Beverley wrote one of the most heinous villains and - she's a woman. Therese Bellaire is as vile, ruthless and heartless as they come. We are introduced to her villainy in the first book of her Company of Rogues series and her talons dig into more than one of our heroes. I could list some of my favorite Jo Beverley books but I fear that list would include all of them. Her traditional Regencies hold a special place in this reader's heart. I will say that Emily and the Dark Angel is an all-time favorite of mine. Once again, her hero's moniker of dark angel for his looks and temperament comes to nothing when his better half proves to be more than his equal in every way. The book will make you laugh out loud and sigh with such contentment. Actually, all of her books will effortlessly take you away and leave you so much the richer for it. 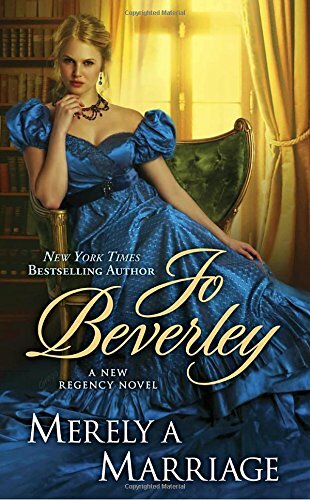 I don't remember which of Jo Beverley's books was my first but I do remember that each of them was special, transporting me to Regency, Medieval, or Georgian England and introducing me to characters who became treasured fictional friends. I'd be hard pressed to name a favorite book, series, or character. Many of her books populate my keeper shelves, characters like Dare, Rothgar, Simon St. Bride, Brand, and, of course, Emily and her dark angel, Piers Verderan linger in my mind still, some more than 20 years after reading their stories. That, my friends, is powerful storytelling. But, while I cherish the books she wrote, it was the woman behind the pen who made the greatest impression on me. 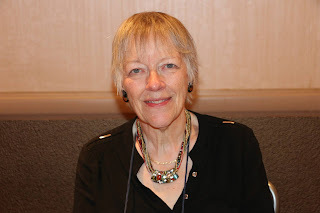 I had the opportunity to meet Jo at several RWA national conferences. This NYT Bestselling, multiple award-winning legend of romance was unfailingly gracious, greeting readers with a smile, kindness, and appreciation. No pretenses or diva behavior for Jo Bev. She always took a minute to chat with me, pose for a photograph, and thank me for reading her books. I have many photos of her taken at conferences over the years. She is smiling in every one of them, even the candid shots. I mourn her passing but I celebrate her life, her achievements, the memorable characters she introduced us to, and the journeys we traveled with them...and her. Tell us about your favorite Jo Beverley books, characters, or memories. Note: The Word Wenches Blog, of which Jo Beverley was a part, is celebrating their 11th anniversary today and sharing their floral tributes to Jo. Stop by today or tomorrow and leave a comment for a chance to win books from the Word Wenches authors. What a great tribute. I remember years ago finding her books and reading one after another. Reading your post makes me want to reread her stories. I've been reading her books for more than 20 years but reading Janga's tribute makes me want to go back and re-read all of them. PJ I had the same response. Beautiful tribute, Janga. I have most of Jo's books, but some of them, well, it's been decades since I read them. Time for a grand reread. RIP, Beverly. My condolences to your family and friends. Am sorry to say I have never read one of her books. Then you have lots of wonderful reading ahead, ladbookfan. Jo Beverley's books are wonderful. A special favorite of mine is her book Christmas Angel. It is on my keeper shelf and is a frequent re-read during the Christmas season. I enjoyed that one too, cheryl. I'm looking forward to reading this new one too, regencygirl though it will be bittersweet, I'm sure. Jo Beverley's novels have given me hours of pleasure and enjoyment. They are memorable. Skylark was unforgettable and a favorite of mine. Jo Beverley's books are treasures. Skylark is one of the few Jo Beverley books that I have not yet read. I'm glad I have it to look forward to. I cannot possibly choose a favorite of all of the gems Jo has written, though I think of Devilish just a few milliseconds before the rest when I hear her mentioned. Off to reread the Rogues now. Devilish is a favorite of many, I'm sure. Enjoy revisiting the Rogues! Lovely comments. I've read about 3 of her book - not nearly enough! She will be missed. Think of all the wonderful books you have to look forward to! I think I've read about half of Jo Beverley's so I've got more to enjoy. I adored her Medieval stories like Dark Champion and The Shattered Rose. This year since Jo passed has flown by - thank you all for sharing your thoughts and memories. I agree, Di. The past year has disappeared much too quickly. I share your love of Jo Bev's Medieval stories. It's one of my favorite romance eras. Which is a lovely tribute in itself, jcp. What a wonderful tribute. I haven't had the opportunity to read her books yet, so it was nice seeing what your favorites were. You have a lot of wonderful reading ahead of you, Kim. I think she was probably a "tour guide" (love that!) for many readers. When I decided to write, I had been absent from Romancelandia for a very long time. I found the Word Wenches. Jo Beverley was one of the authors I glommed to see how it was all done. It's a wonder I dared put my fingers on the keyboard, for there will never be anyone who can measure up. There's a reason she's called an icon. I love that her books inspired you to put your own words to paper, Maggie. Those of us who enjoy your books are very happy you dared! LORD OF MIDNIGHT – The whole idea of this story and how being a champion for the king worked truly fascinated me. She really brought this period alive for me with this one. AN ARRANGED MARRIAGE – Nicholas’s calm, gentle and reassuring handling of Eleanor on their wedding night. I fell in love with Nicholas then and would forgive him anything from there on in. AN UNWILLING BRIDE – Lucien’s very real and very sincere regret over his behavior toward Beth. And of course one of my favorite scenes toward the end of the book of the rogues running into the Duke of Belcraven after having accomplished their mission and celebrating their victory. DEVILISH - Rothgar knowing what Diana needed and giving it to her (control) when another hero would have stormed in, meted out punishment and asserted his power and control in a similar situation. RIP Jo, you and your storytelling genius will be missed. I think the best part of this post is the reminder by Ms Beverley that love does exist. I did not have a happily ever after in my life and when I was at my lowest, I discovered romance books. It is just as she said, one can find a world which is filled with true love and people who love one another. I appreciate her contribution to that world. And aren't we fortunate that someone like Jo Beverley wanted to take us to that world? Such a wonderful tribute! And I've just realized that I don't think I've ever read her....and why not??!!! I have absolutely no excuse!!!! Thanks for reminding me that there are still amazing writers (unfortunately in her case who are not still with us) out there that I haven't discovered. And isn't it so wonderful that we can "meet" them through what they leave behind for us?! Thanks again for the recommendations!!! 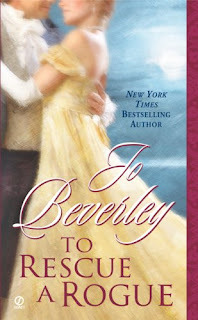 My first Jo Beverley book was also my first historical romance--St Raven. I feel in love with the author and the genre immediately. Like Janga, I have a shelf--more like a room--full of keepers that are my "comfort reads". St. Raven is front and center! I was deeply sad about jo Beverly dying last year and recently I was lucky to find her first publish books. I am currently reading them and I loved the company of rogues. I can't wait for the new book even though it will be the last. I will always treasure her books. It has been a while since I read one of her books. I did follow her on The Word Wenches. Her posts on her research and information on Regency England were always interesting and enjoyable. It was such a shame that the Romance World lost her much too soon. Jo's books were some of the first ones I read when I came back to reading romances after many years away from them. She was also the first author I had contact with over the internet - I honestly don't remember what triggered the emails, but she was a very kind and gracious lady. Because of her, I started following the Word Wenches and discovered many other amazing authors. She was taken from us too soon. My first Jo Beverley book was The Stolen Bride. I read anything in the library that looked like a Walker Regency, and when I picked this book, I was bowled over. My absolute favorite of her books is Emily and the Dark Angel. The purple powder scene is unforgettable! Jo and her talent are deeply missed. The first time I met Jo Beverley, she taught me how to play silver loo. I'd been reading her books for six years, and attended my first RWA conference in Dallas in 1996. The Beau Monde soiree the night before included instruction in Regency pursuits such as dancing and gambling, and I was totally star struck at first to find myself seated next to Jo. She was gracious and quickly put us at ease, and taught us how ladies could play cards for hours winning or losing only small amounts of money, compared to rogues losing their inheritance playing whist. From then on I "heard" her lovely voice when I read her books. At the readers luncheon in Portland in 2002 that Janga mentioned, I brought a copy of her most recent release to sign, only for *her* to discover when I got to the head of the line that she had already signed it for me, at RWA the summer before. We shared a good laugh that it was proof that yes indeed, I was a big fan of her work. I'm sad that she's gone, but grateful to have so much of her work to read again and again. Thanks for the great tribute, I enjoyed reading it very much. It's so, so hard to pick my favorite Jo Beverly book. Among the classic Regencies, it's neck and neck between "Emily and the Dark Angel" and "Lord Wraybourne's Betrothed". I love the way the heroine in the latter book inadvertently foils her nemesis, it's so delicious and subtle the way it's written. My favorite Malloren is Lord Cynric. In spite of the serious and traumatic events that happen to the heroine, "My Lady Notorious" has some hilarious parts. What a sense of humor Jo Beverly had! And of course I'm a fan of the entire Company of Rogues. I want to put a word in for "The Demon's Mistress. The hero Van very atypical; he's not only younger than the heroine, but suicidal. As Janga said above, Jo was not afraid to take risks with her characters, and the results are stunning. Thank you for this tribute. She was a fabulous author. I loved her and her books. She never failed to inspire me. Thank you for this. Jo was a dear, dear friend and an inspiration to me as an author. She deserved every word of this. I miss her so much!! Thank you so much for writing this lovely tribute to Jo. I miss her on so many levels--as a fellow writer, as a reader who loved her books and as a friend.